Osama Bin Laden was a bad guy; the terrorist leader who was behind the September 11 attacks on the US. He then became the face of the war on terror. He was hiding in a compound in Pakistan that was raided by US Marines and he was killed. 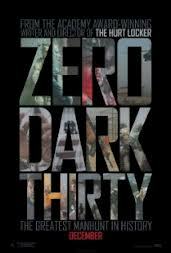 Zero Dark Thirty is the story of how this came about. As with most films based on reality, it’s hard to judge what is strictly fact and what has been changed for dramatic effect. It doesn’t shy away from some of the ugly truths of the war – the detention and torture of suspected terrorists, including waterboarding. It’s certainly not an easy film to watch; although, I was expecting worse. I went into the film with memories of director Katherine Bigalow’s previous, Oscar-winning film, The Hurt Locker. That film almost killed me. There was a tension that had me on the edge of my seat, gritting my teeth and waiting for something awful to happen. In Zero Dark Thirty, awful things happened, but I didn’t really have the same emotional connection to it. It’s a strong film; long, but it didn’t drag for me. It actually felt to me like a weaker version of Homeland, the television show. It’s probably a shame that this has come out in the same year as Argo, which I think has taken a similar type of story but told it in a much stronger way.